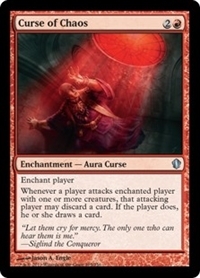 Whenever a player attacks enchanted player with one or more creatures, that attacking player may discard a card. If the player does, they draw a card. 10/17/2013 Curse of Chaos’s ability will trigger only once per attacking player per combat phase, no matter how many creatures that player attacks with.